we all use sketchbooks, notepads, and journals to record the day-to-day: our strongest ideas, greatest inspirations, personal thoughts, places we’ve been, and hopefully all the incredible things we will create. they are part of our life, our memory, who we are and how we will shape the world around us. the problem with digital sketchbooks is that while they are slowly turning everyone into digital artists, there is still something missing in their equation. 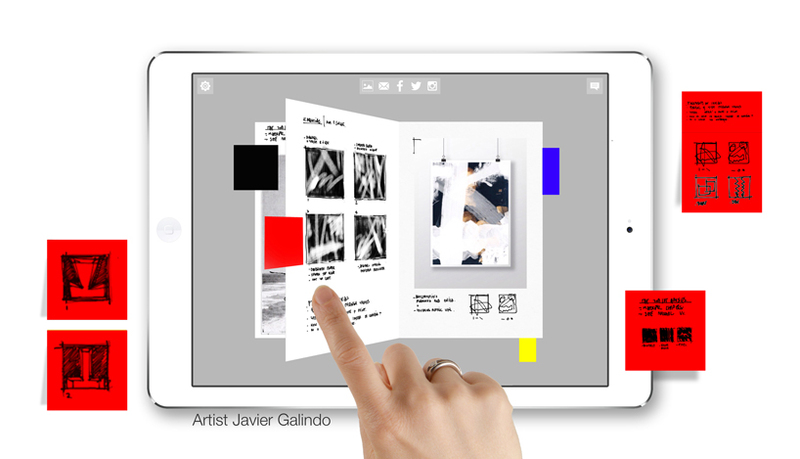 morpholio introduces ‘journal‘, an app that redefines the sketchbook as a mixing chamber where photos can influence drawings, and drawings can inspire thoughts. it is a place to create, reflect, muse, develop, and reinvent; whether starting the creative process or developing a masterpiece. now, designers, artists, writers, or members of any creative culture can write, draw, sketch, collage, paint, or color on anything, anywhere, with a sketchbook of infinite possibility at their fingertips. 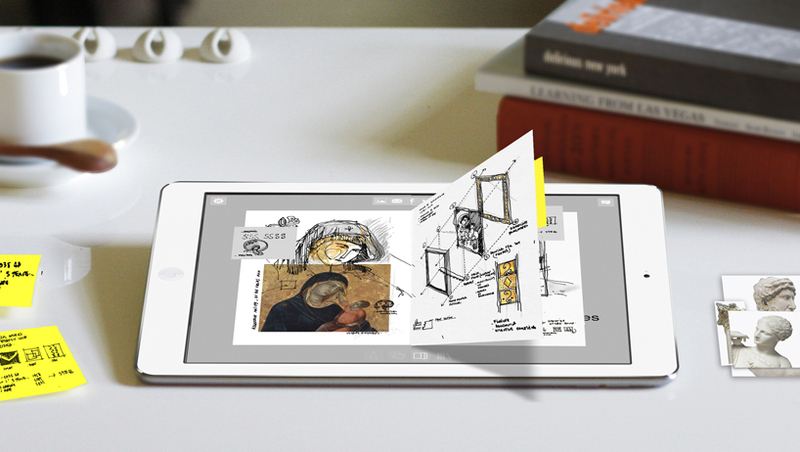 the ‘journal’ allows users to sketch and write on any media. design over an image, get creative with a photo, or make backgrounds of any type. sketch on top of any surface, and the sketch will literally move, twist and scale with the image it’s on. draw on everything to build the ultimate archive of inspirations, ideas, and encounters; allowing the long memory of the computer to augment the short memory of the individual. morpholio can now collect and store more information than ever before and require new ways to get through it, while not missing what everyone needs. clearly the scroll is not the answer. 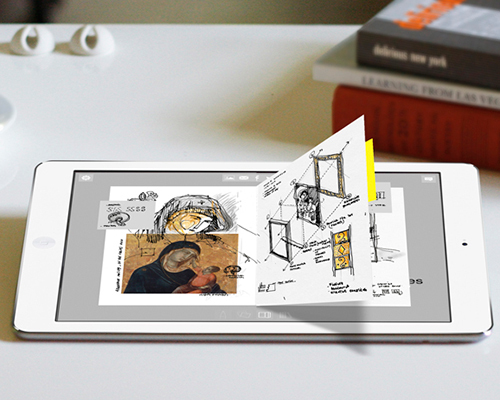 in ‘journal’ users can soar through your infinite number of sketches, images, notes, photos and thoughts with the touch of a finger. this groundbreaking approach to viewing yields an ultra fast, highly optimized page-turn interface making the entire book accessible to discovery and review within seconds. ‘journal’ includes eight pens, brushes and pencils including chisel markers, charcoal, and other rendering tools capable of sheer digital magic. with unique line types per tool, they are carefully calibrated, not just for artists, but for designers who need to sketch in fine detail and diagram with precision. the collage, a tool of invention for many creative cultures, has been used to re-mix any number of visual media to promote new ways of seeing. a sophisticated drawing and painting platform opens up to the art of sampling, creating a collage tool that allows users to layer their everyday findings and thoughts in one place. build mixed media artwork or layouts, photo albums, mood boards, material boards, scrapbooks, or rich archives of your discoveries, ideas and creations. ‘journal is an infinite sketchbook that goes with you and grows with you. its speed at jumping between pages is important. it’s about reviewing and remembering as much drawing and documenting. Its unbounded number of pages and ludicrous speed will make enjoying all of your sketchbooks a daily pleasure,” describes morpholio co-creator mark collins. ‘whether you sketch daily or occasionally, inspiration strikes us all at unexpected moments. morpholio journal is ideal for designers, architects, photographers, artists, travelers, or members of any creative culture. its unique book interface affords instant and easy navigation of thousands of pages, unlocking infinite potential. finally, you can keep track of everything you encounter, and find new ways to visualize, test, and explore the world around you. check the morpholio ‘journal’ and download the free app here.